With recommended daily allowance for fruits and vegetable being 5 per day a trip to the grocery store can look like a piece of art. I love vegetables and fruit but I still find it hard to get the recommended amount each day. I had strawberries, grapes and pistachio nuts for lunch yesterday. Cauliflower at dinner and I nibbled on radishes in the afternoon. Still not 5 servings but close. Normally this picture would have sweet peppers in it too. Oranges, reds and yellows. I went to two different stores yesterday and the peppers were lousy. There is a lot of talk now about the 100 mile diet. Not a weight loss diet but one to lessen the load on the earth caused by trucking food everywhere. They are filming a show about it not far from where I live in the Lower Mainland area of Vancouver, British Columbia. I'm sorry world but we don't have the warm temperatures of California or Florida or any other warm place. My picture above would contain some lettuce and hot house grown tomatoes and cucumber. Maybe some onions left from last year (not the way we go through them) and whatever stuff I would had canned last summer. I am too selfish I know but I can't won't give up on this wonderful, fresh healthy food. The Gypsy's Corner. Just click on this photo. Your blog name is great-- made me smile. Hope you have terrific Tuesday! Gorgeous veggies...so fresh looking!!! I agree with Carrie...I love my veggies anyway you can make them!!! Cute post!!! Have a wonderful Tuesday!!! Lori, I love veggies! Your picture looks so good! I've heard about the 100 mile diet on NPR not long ago. A product of all these crazy food recalls! Sounds good in theory...but boy have I gotten spoiled having Summer fruits n veggies in the dead of winter. 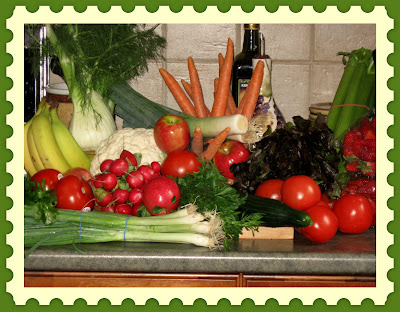 I made it easy on Mom when I was growing up - I loved veggies then & now! I am not sure I could get used to having just "local" produce year round. what would I do for lemons in the dead of winter? I love vegetables, too. Although I do think it's too bad that molding chocolate into the shape of a carrot doesn't turn it into one of the 5 dailies! Cass: That one I do know..you use lemon grass but I don't know how long it keeps. I am far too selfish to give up my produce. Sorry. I need to eat more fruits and vegetables too. I don't eat enough of those. First time I have heard of the 100 mile diet. Will have to read up on it. Fruits I can handle but veggies are not on my list of things to eat and I know I should eat more. Thanks for the reminder.